Enjoy convenience, comfort and safety wherever you go with ROHO's Love that Valve! 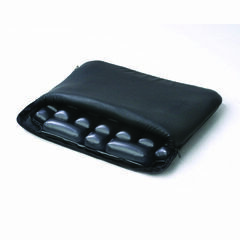 The LTV restributes pressure to maximise comfort for the user. Its easy-twist valve tailors to support your needs precisely, and an active network of dynamic comfort cells adjust instantly and shape to your contour. Lightweight, foldable and portable. Suitable for vehicles, travel, wheelchair use, mobility devices and in the office. Available with fabric or vinyl cover.